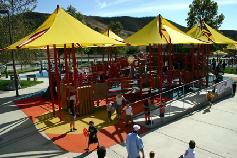 Brandon's Village is a universally accessible playground which is named after Dina Kaplan's son Brandon. 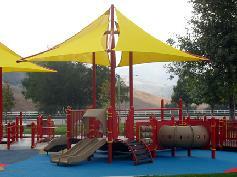 The playground has a section of equipment for 0-5 year olds and another for 5-12 year olds. Most of the equipment is wheelchair and walker accessible via ramps. 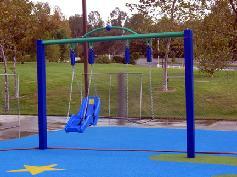 The surfacing is rubberized, easy to walk on and soft to land on. On the first Saturday of every month we hold Brandon's Buddies Play Dates. These are free programs open to children with special needs and typically developing children. They are from 11:00 a.m. to 1:00 p.m. at Brandon's Village located at 25801 Thousand Oaks Blvd., Calabasas, California. We provide art and crafts projects, face painting, entertainment, snacks and fun! Please join us! For more information contact Dina via email at brandonsbuddies@pacbell.net. or visit The K.E.N. Project web site at www.kenproject.com.